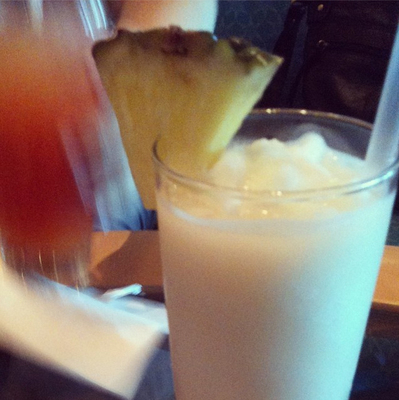 A Piña Colada at sea is something different! Cruising can be a wonderful way to celebrate a holiday, escape cooking and cleaning, and feel a little bit fancy while you are at sea. On board Royal Caribbean's Voyager of the Seas cruise liner which services Sydney, I was able to experience my very first Piña Colada. Served in a tall glass, the classic cocktail almost filled the brim! Topped with a decent sized piece of pineapple (which unfortunately can never taste as fresh as the real thing because cruises are all about food which can be stored for long periods of time), the consistency of this drink was creamy and delicious. I took my time enjoying the flavours of the cream of coconut, rum and pineapple juice, whilst others rushed off for a refill at only $8 USD (the cruise liner operates in USD currency, even in Australian waters). Thankfully the cruise had fairly good weather and I was not caught in the rain!